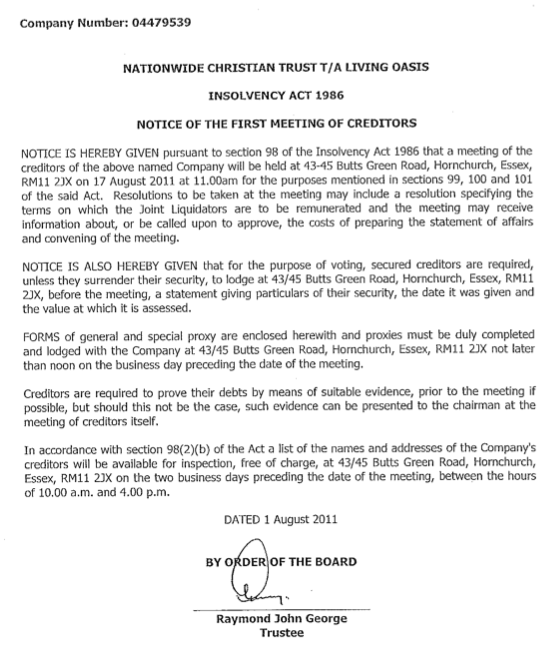 NOTICE IS HEREBY GIVEN pursuant to section 98 of the Insolvency Act 1986 that a meeting of the creditors of the above named Company will be held at 43-45 Butts Green Road, Hornchurch, Essex, RM11 2JX on 17 August 2011 at 11.00am for the purposes mentioned in sections 99, 100 and 101 of the said Act. Resolutions to be taken at the meeting may include a resolution specifying the terms on which the Joint Liquidators are to be remunerated and the meeting may receive information about, or be called upon to approve, the costs of preparing the statement of affairs and convening of the meeting. The notice goes on to provide instructions to creditors on how to submit claims and advises that a full list of creditors will be available for inspection on the two business days immediately before the meeting. YOU GUYS AT NCT SERIOUSLY DISAPPOINT ME!!! Its an insolvancy notice Mike. A legal document that NCT are required by law to post. However disappointed we may be, you can’t blame NCT for the wording. sorry but you misread my note! Mike, that’s not a comment left by NCT: it’s a pingback from an eChurch Blog post entitled “NATIONWIDE CHRISTIAN TRUST, owners of Living Oasis, go into insolvency” (pingbacks are autogenerated links that appear in the comments thread between cross-referenced blog posts). Very very sad news for all involved indeed, I really hope that this is not a another blow for suppliers and publishers though after the blow that WO/Bliblica/STL was and prior to that SSG/SPCK. It is so sad when chains or businesses fold, it is gutting that they then potentially take so many others to the edge along with them when they fail to honor their debts. My heart and prayers go out to any caught in this situation, suppliers or others as may be owed monies, to the remaining staff in such trying times, to the staff already made redundant, and to Ray George and others involved in NCT/LO. Nationwide Christian Trust, which owns the Living Oasis shops, is now “in liquidation”. It is very sad for not only have lots of people lost their jobs but Living Oasis suppliers will probably now lose, in some cases, lots of money. With regard to myself , my interest in six of these Living Oasis shops remain. I have complete confidence in our Heavenly Father who I know would not lead me into something that would do me harm. I once told Father that I did not mind doing crazy things for Him as long as I knew He was in it. As I go on retreat this weekend my question to our Father is “Was it you who said that when I give you the Wesley Owen shops I want you to put Jesus Is Alive! postmark on the front of them?” If Father confirms it, then it is a done deal; for God is not a man that He should lie. In this particular case the £500,000 I will need to rescue these 6 shops is on the way! In the past God has given me £100,000, £50,000 and £20,000. So I don’t think it is a problem for Him to give me £500,000. So I wait patiently for Him to tell me what He wants me to do. I will not take any loans so their is no risk to my current shops. Father knows best and I have told Him that if He is not in this I don’t want the money. However if He gives me the money the success of these new shops is assured for He is Chairman of our Board and He will tell me what to do to turn them around. As Hudson Taylor said God’s thing, done God’s way, will never lack Gods supply. I wait patiently for Him to speak and will do nothing until He does? The future of these shops that have now died is in His hands but He is a God that gives life to the dead so let us all wait and see if God will be merciful in this case and do a miracle? As my friend Ray Hogg and I travelled around the country looking at these Living Oasis shops we both had a sense that God was with us and that we were seeing them through Father’s eyes. I have just been reminded of that wonderful hymn all the way my Saviour leads me. Praying with you, Paul … though I wonder: didn’t Ray George and Andy Twilley believe they were following God’s will in launching Living Oasis? Didn’t they go into things with that same confidence in God’s leading that you’re expressing? … and what of the former WO/LO employees, who also felt assured that they were doing God’s will but now find themselves set adrift, bereft and betrayed? What God — indeed, what kind of God — is this, who you believe will provide £500k to rescue a handful of Christian bookshops, but who allows tens of thousands, if not millions, of people to starve and go thirsty right now in Africa? Phil, You are right to point out that we all do things believing it to be the will of God and sometimes maybe it isn’t as much the will of God as we wish it was. You are right to say we must question our actions, that we should look to the justification of our actions and ask questions such as should we ask for money to maintain a few shops in a rich country when millions starve who could be saved by that same money. you are right to raise up the fact that our God frequently calls us not to success and glory but to suffer for his glory instead, indeed in Christ the ways of man were turned on their head – the first shall be last indeed. and yes what kind of God is that? You are wrestling questions many do and have – think on Job. but more importantly perhaps is the question what kind of people are we? Are we a people that watch others suffer, that choose us over them, that speak words that are empty, that give bonds and default, that choose a message of riches over one of sacrifice, that choose a benevolent father at the expense of a passionate love affair with the constraints that might entail! Are we a people of hope and joy or of misery in the face of trial? These are the questions – What kind of God is our God? One beyond our measure but not beyond our hope, one with a better understanding of all things than we can ever hope to have, and yes one that calls us to suffer as part of our faith and has never told us other than that! Because it is in the suffering that we are tested, it is in the suffering that we are shown the possibility of glory, in the suffereing that we are tested to make the choices that just might make us more – even in the loss. Disciples: Send the people away so they can get something to eat. Yes indeed: what kind of people are we? Paul Slennett: may you be a water walker extraordinaire! Right behind you all the way in prayer Paul!!! What seriously disappoints me is the now broken promise that “Ray George” made to pay all the suppliers NO MATTER WHAT !!! As the Living Oasis shops did not continue for two years, the staff are not entitled to redundancy pay. I sincerely hope they all recieved the back pay they were due before this insolvency was declared. It’s a very, very sad situation all around, the situation has moved so quickly (and badly) in the last few weeks it’s hardly recognisable to me, and my heart goes out to all affected. The only bright (-ish) spot I can see is that every employee has been paid up to date of closure according to what folk have said to me. Also, as previous manager and obviously close to my heart, Harrogate is a shop with much potential & is one of the few in profit in both STL days & Living Oasis, The Harrogate shop was taken on under Tupe regulations & the staff who went through the takeover there are entitled to redundancy pay. Please pray someone comes forward to take this shop & its staff on as it has huge local support – it is for sale and profitable! For those of us no longer in “the trade” this is a time of very mixed emotions. I have so many friends out there affected by this. For some of them this is the second time this has happened and for one or two it is the third time. I am in no position to make any comment other than this is a very very sad day. My heart and my prayers go out to you all, dear friends. We’ve been chasing for payment of an invoice from July 2010 for over £300. We’ve just received the insolvency pack from them in the post today. As a very small supplier its going to make us very wary of supplying chain-stores again. At least small independents do pay there way. Also, just for your delight, the documents sent out basically say that at the meeting the creditors will agree to the FRP Advisory company to be liquidators and entitle them to charge out of any assets NCT owns the following hourly rates for its staff members when involved in handling the winding up of NCT. Manager £260 / hr all the way throught to Trainee Administrator at £105 / hr and Administrative Assistant at £90 / hr. They’ll be nothing left! Takeaway: you now only need 90 shops to cover 50% of UK population. Yes, that’s my belief too, and I was given to understand that in Manchester, there had been some moving around of fittings to bring the coffee shop forward with the books behind. To confirm what Knowing says, LO did not get to the point of trying coffee. The Leeds store could have been up and running months ago with coffee on offer to sample. Oh and what coffee! Those of us in Leeds know because we have sampled it and it would have been a huge hit. The business plan for Leeds as properly and realistically put together by the staff in Leeds showed that it would have worked. But it was much more than just coffee. The premises at 77 Albion Street are a real gift from God and Karen et al had a real passion to use them as a base for fantastic outreach to the many communities using Leeds city centre. The position of the store, its three stories of excellent rooms and facilities would have made it a hive of activity> there were plans with local churches to run Cafe Church, Arts events, music, theatre, debt councelling, street work, healing, prayer, youth events etc. all in a location that did not have the stigma of being a church building. During normal shopping hours the coffee, book/gift shop and meeting rooms would be available for normal commercial activities but with a difference. The coffee would be directly sourced (better than Fairtrade), much of the food locally and ethically sourced and the staff would include reformed drug addicts in a link with Horizon Life charity, a follow on from Teen Challenge which gets reformed and reborn addicts back into the world of work. If this was not a recipe for success then …… However, these things were and still are the vision of those in Leeds. Sadly the NCT did not have the real faith to see this to its logical conclusion or to back the store when it could have been open and doing God’s work. We can only speculate about the reasons for this. It is in changed lives that we can begin to change our world and deal with the hunger for both food and meaning. So no Phil it isn’t just about protecting a few bookshops, the vision is much bigger than that. The bookshop as we know it is dying so the wider vision of Leeds is where we need to go, not just to make money but to provide a presence in our city and town centres from which we can build Christ’s Kingdom. That is worth promoting. So if anyone with the dosh and the willingness to allow God to have all the glory is reading this, 77 Albion is still there and waiting to let a real vision from God come into being. Amen, God pour your blessings and mercy down on 77 Albion. As I stated previously I pray (and others should pray), that God will do a new thing in the life of Christian Retailing in the UK. 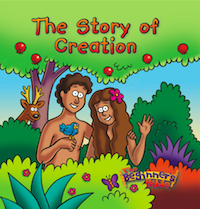 It is not just about selling Christian Books to Christians anymore. It is about reaching out to the lost at the point of their need (s) with the use of Christian Gifts and Resources, that Glorify God. Stop panicking – Stand still, wait and see what the Lord will do – He will give creative ideas and a strategy. If it is of God – No man can stop it! Hey Carole W — to reiterate my reply on facebook, for most of us in the trade it never has been simply about selling Christian books to Christians: it’s been about — to use what’s almost a hackneyed phrase now — “mission on the high street”. That’s always included serving the Christian community, to equip them for mission and service, but the remit of most Christian booksellers has always been to be the presence of Jesus in the marketplace. Please go read this post from back in 2008 to understand where we’re coming from: Christian Bookshops — who needs them? One man’s Ego Trip is very dangerous to all associated with it. I fear that we have another one coming along soon! Viewing everything through rose tinted spectacles leads to bankruptcy in the real world Phil! That’s why there as a reducing number of (badly run) Christian Bookshops. Not sure who’s wearing the rose-tinted specs, though: maybe Ray George and Andy Twilley were, but if you look back through the various conversations about the trade here, I think on balance you’ll find a realistic and robust approach, albeit alongside a certain amount of wishful thinking and a sprinkling of humour. May I suggest that you have a chat with your superb staff, including the remarkable Anna Bunn, with whom I’ve had several conversations via facebook over the last couple of years? She should be able to enlighten you about who I am and hopefully dispel your misconceptions about the alleged “organised negativity” you think you’ve found here. But to help you find your feet and by way of brief introduction: I’m the founder of the UK Christian Bookshops Directory, of which this blog is an extension: please check out the About page for more background. Follow me on twitter or find me on facebook if you’d like to get to know me better. I’ve been following the Living Oasis story (alongside dozens of other stories within the Christian book trade) from the very beginning, rejoicing in its ups, made despondent by its downs, calling people to prayer and encouraging people to support their local Christian bookshops, including Living Oasis Liverpool (latest Liverpool report here: Living Oasis Update: Julie Jowett leaves Harrogate for Spain; and Liverpool plans September Opening, 02/07/2011). You’ll find an index of my LO reporting here: Q&A: What’s Happening to Living Oasis? (at the time of this post, last updated 04/07/2011, so admittedly now somewhat out of date). Sadly, there are more negative reports than positive, but that simply reflects the way things have worked out. I repeatedly asked Andy Twilley to keep me updated to help ensure balanced reporting: he declined, responding instead with an attempt to block my reporting by instructing staff to block me on facebook and prohibit them from communicating with me, an attempt that failed as frustrated staff began to tell me about the contemptuous way they were being treated and the disreputable ways in which NCT were conducting their business affairs (and given the current state of play, I see little point in going further down that road). The only things needed, Phil, to ensure an upbeat reporting of developments in Liverpool, is for you and those involved with the store to keep me in the loop, please. A good start would be to remove your facebook blocks and add me to your press release and prayer request mailing lists. Back to you, brother, and please rest assured that you and those struggling to pursue the LO vision with integrity elsewhere (Leeds, Harrogate, and Watford) have my wholehearted support. Phil – we are not NCT, all the information we can offer is on our website, I am not asking for upbeat or downbeat reporting. We are doing our best to fulfil a vision which existed in LIverpool long before LO was on the scene. It seemed natural and apporopriate to seek to work with them. I hope we can be a positive Christian presence in a world which needs it. Glad to see that you are committed to your Liverpool shop that’s a wonderful and rich start – however I think it a bit rich for you accuse other area’s, of which I suspect you have little direct knowledge or contact with, of having ‘no serious interest and support from local churches’ whilst accusing others of organised negativity! Just because other area’s do not choose to have the same vision as NCT/LO – ie a coffee shop and meeting room model for their bookshops that they wish to fund and support does not make them the ones in the wrong – indeed a number of the towns this is labelled at already had those missions up and running in different venues so to go ahead with it in the LO stores there would be to undermine it elsewhere where it is already working and happening – surely this would not be, could not be, the right thing to do? Better yet would surely have been for NCT/LO to have adapted it’s vision and mission to something just as able to be sustained in the area’s and to develop and support the bookshops instead in this manner – this is something a number of us in the book trade have had to do over the years – adapt ourselves to the needs of the community and not expect the community to adapt itself to our needs! If we adapt to the needs of our local community (church and unchurched) then sustainability should likely follow (worsening economic gloom withstanding) but if we fail to do this and expect instead the community to change to fit us without regard for their needs and wants then surely all that can happen is a sad decline for all involved? In this instance then is it really fair to blame the community for the failure? or is it fair to say there were deeply mitigating circumstances that caused the failure that could perhaps have been changed? I think if you read the blog carefully and with regard you will find that is what most on this blog – most of whom have many many years experience into the book trade from bookshop, publishing & suppliers perspectives – have been trying to say. It has not been deliberately negative, contrary or with any ill intent – rather it has been with a heart for the trade in general and at times LO directly to succeed. Trying to raise flags and offer insight gained through our own experiences of loss and growth. None here wish to see any fail, sadly these days we have watched this now happen a number of times and in sadly similar circumstances that leave desolation and heartbreak in their path and in our hearts – yet still we carry on believing that our ministry. our trade, our calling is yet a viable and important one despite what some say. Yes in Liverpool you have indeed embraced the vision as one perfect for your community as outlined by NCT/LO – I heartily congratulate you for this as I do Harrogate, Leeds, Watford and other places where such things happen and are happening – not just LO stores but other Christian Shops as well – this is a wonderful thing and a great blessing that continues to prove that there is yet hope for the trade in a varied hue indeed. However in those places where such is not the case I do not think it is entirely right or fair to blame the local church community alone for the failures. No more than I can fault NCT/LO for having tried to do a good thing in trying to keep a great number of Christian Bookshops open. Phil J, I pray for Liverpool LO’s opening, success and growth, I pray too for Leeds and it’s enthusiastic and committed manager that it too shall soon open, I pray for Harrogate that it shall find a new owner and remain open, I pray for all the shops now closed and all the places without a Christian bookshop that they may be blessed with an independent type to hear the voice of God and step out in faith and with a keen business brain! I pray for NCT and all involved with it and effected by this sad situation that the losses may truly be mitigated and the debts repayed as should be. I pray for all these things not as a negative though there may be shadows in them, but rather as a positive, in the testing we are proved. Thanks Melanie – I fully agree with much of what you say. I am not seeking to blame anyone, I am simply stating a fact. There was not sufficient local support for many of the other LO stores to develop – It is interesting that it is you, not I, who says that those local areas are in the wrong for not doing that, so please don’t have a go at me for things I never said. It may indeed be a mistake on NCT’s part to have tried, they may have got the balance wrong between trying to create the strength of a national brand and adapting to local circumstances, there may be quite legitimate and missional reasons for that support to have not been forthcoming. It does not change the facts – there wasn’t support. I am not pointing fingers, I am stating a fact – too many shops could not attract sufficient support for the whole project to move forward, and this meant that the stores with that support could not move forward either. My point remains – why do these simple facts generate so much negativity? My conclusions are simply based on visiting this site for the first time to try and measure attitudes towards us as we seek to move the Liverpool store forward. I had been told that there was a lot of vitriol flying around and wanted to see for myself. You are right I am a total newcomer, I don’t have the same experience of the trade that many of you good folks do – but I have to say that I was saddenned by the tone of what I read, and that’s what promted me to write. I just trying to fulfil a vision and support something I believe in. I could certainly add to the lists of criticism, but live with this quaint idea that my faith teaches me not to repay evil with evil, not to speak badly of sisters and brothers and to forgive those who wrong me. My truck is not to defend anything that has happenned but to question whether Christians should be slating each other off in public. Thanks for responding Mel, sorry if my comments offended. I shall go on repeating I do not hold and never have held NCT to be in the wrong for wanting to do a good thing and trying, however community means working with each other, many of the area’s and communities you seem insistent in saying did not support their bookshops did support their bookshops, however you are correct that they did not support the whole vision as NCT wanted it, it is my understanding many of these communities had been upfront about that from the get go. You misunderstand the negativity – it is not that NCT tried and failed – we all do that at some time – it’s generally how we learn best, it is the way in which it has been handled that has caused the great sadness and hurt, many rooted for them, wanted to help, offered to help and offered insight when they could see problems arising, many in the local communities you dismiss also did their best to offer support. Support was definitely not something that was lacking except on one front. Sometimes it’s hard to see the support being offered and accept it – especially if it doesn’t fit with our own interpretation of what we want or need, even if it may be what we most need but can’t see for ourselves. To grasp what I’m trying to refer to here think counselling, think secret shopper or Mary Portas visiting charity shops & businesses, think an objective or experienced pair of eyes looking over something. I’m surprised by what you say as to ‘to try and measure attitudes towards us as we seek to move the Liverpool store forward’ because last I looked everyone here has been rooting for you to open, waiting for you to open and praying for you to open and getting more disheartened for you, and the others like Leeds, the longer it has taken, when we find it is still on we have rejoiced and prayed for you at least so far as that I am aware of. I think part of the problem is that you have come late to the table as it were and have missed the greater parts of the discussion, not all of which have happened on the posts headed LO, add to that you seem to have come to look for the vitriol you had been told about and in so doing found all coloured by that filter. As I’ve said before, we are praying for you and we are rejoicing for your shop and your community and for your passion for it and vision of it – long may it continue and thrive, with such passion and vision it surely will work well and go on to be a great asset to the Liverpool community. And yet you did, and have, and are here in public doing it. As to your final point, if you had asked that directly right back at the beginning then I would have said to you, as I previously have numerous times pointed out on this blog, that actually our faith and the bible teaches that it is our job to call out against what we see as wrong actions and to offer insight and guidance to each other as we can even when the ones we see doing it are our brothers and sisters in Christ. Phil, would you like to ask the people who say there’s “a lot of vitriol flying around” to contact me with their concerns, please? There’s certainly a lot of disappointment at the way NCT has handled its affairs in terms of the way they’ve treated their staff and business partners (see for instance Comment 6 above from Mark Fleeson on an invoice outstanding from July 2010) and at the lack of openness within the organisation. Many of us in the trade have repeatedly reached out in friendship to offer our support and prayers only to have our approaches rebuffed; but vitriol? The closest I think anyone has come to that is perhaps Mike Levy’s angry shout out, which was based on a misunderstanding of a pingback. As a writer who has been reporting on the ups and downs of the Christian book trade for longer than I care to think about, I aim to offer a balanced perspective, reporting both good news stories (do please click through that link and note how many of those good news stories feature Living Oasis) and bad; but with the best will in the world, I can’t see any way to put a ‘good news’ spin on the current situation. That’s not due to any malice or vitriol, Phil: it’s simply the way things are; and if we as Christians are not prepared to look reality in the eye, to analyse where things went wrong and reflect on how things might have been done better with a view to actually doing better in the future, then we do ourselves and the gospel a disservice. … oh, and on the topic of Christians not slating one another off in public… have you read the way Jesus dealt with those he considered hypocrites in the faith community of his day? Then there’s the Acts of the Apostles, Paul’s letters and Revelation … there’s a lot there we might have to withdraw from publication if we’re going to present the world with a lovey-dovey all’s-well-because-Jesus-makes-conflict-go-away picture of our faith community. No: give me honesty, truth and integrity, warts and all, anytime, because our God is a God who works through our weaknesses and despite our failings, who shines a light into the dark places to drive the darkness away. NCT and Living Oasis were two separate companies with Ray George as trustee of both. The remaining staff from Living Oasis were not paid for the last months work they did and not given details of the firm appointed to wind up the company. In a clever move the work of NCT has been transfered to another trust (the woodford wells ministry trust) also headed by Ray George. Nice way of not paying there eh? While it is unlikely that employees will get redundancy pay (unless they of them were taken over under TUPE, which I don’t think any were), as they have not been employed long enough, they should still be able to reclaim pay for the time they have worked, both leading up to and during the liquidation process. As for protecting many assets (NCTs DVDs, Cards and Gifts, plus the Mulberry House Conference centre etc) by moving them into a different trust. I don’t think that this is particularly unethical. NCT existed long before Living Oasis, and I am glad that, in spite of the failure of LO, that this did not completely destroy the work and ministry of the NCT as a whole. I, for one, am glad that the employees and staff of Mulberry House and the NCT’s other interests are protected, and their employment not also terminated or transferred to a liquidator because of what happened with LO. I do not view this as a “Nice way of not paying” their LO staff, but a great way of continuing to employ the dozens of staff in other parts of the charity, many of whom were employed by NCT long before they created LO. Well said, Luke, and thank you.